Since when did believing in God and having moral values make you pro-war, pro-rich, and pro-Republican? And, since when did promoting and pursuing a progressive social agenda with a concern for economic security, health care, and educational opportunity mean you had to put faith in God aside? Religion and politics belong together when politics gives social meaning to deep, spiritual convictions. Wholeness requires keeping both the Spiritual and Social operating in tandem. "Shalom," one credible Biblical definition of "SALVATION," assumes the fusion of religion and social issues. Using this lens, prophesy and politics can operate as effective allies and a prophet may, in fact, be a political figure. Quoting Jim Wallis I ask, "Since when did believing in God and having moral values make you pro-war, pro-rich, and pro-Republican? And, since when did promoting and pursuing a progressive social agenda with a concern for economic security, health care, and educational opportunity mean you had to put faith in God aside?" -Jim Wallis from his book "God's Politics"
This book starts with the premise that the outworking of faith can and should be social. It holds in tension two positions -- that religion and politics need to be separate and that they properly belong together -- and makes the case that God's way of ensuring wholeness requires keeping both the Spiritual and Social together. The idea that social action has a religious basis, is at the heart of the Gospel. 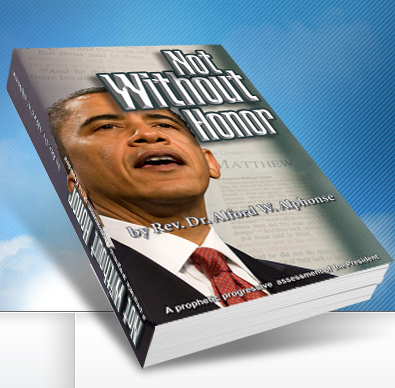 Not Without Honor is a formidable, enlightening and interesting well written book on President Barack Obama by the Rev. Dr. Alford Alphone. 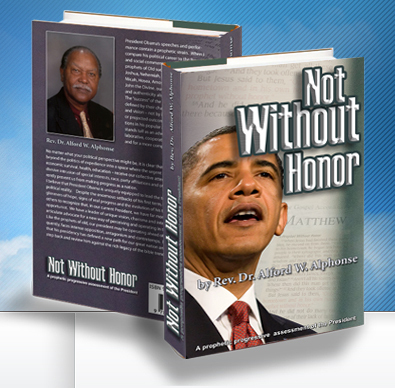 I am acknowledging my own personal autographed gift copy of Not Without Honor. Very impressive indeed. 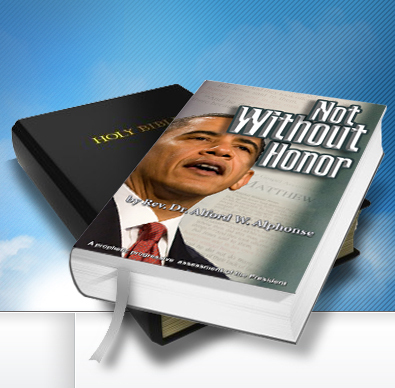 “We have got a copy of “Not Without Honor” and have started reading. We must say that we are impressed with it. Brilliant in conception, and divinely inspired, Alford Alphonse’s book on Barack Obama is a fascinating blend of scholarship and perception. As a career pastor, I have served in the The United Kingdom, Caribbean, Panama and, of course, in the United States of America. Unlike many here, I have never drawn rigid distinctions between and among the the spiritual teachings of the Bible, social equity and justice. Instead, I have embraced the idea that the Bible and the Gospel call for spirituality to be integrated with social policy and attititudes.